Why Choose the 2018 Toyota Sequoia? Like the tree it's named after, the Sequoia is big, strong and incredibly sturdy, a gorgeous work of art destined for the wilderness. From bumper to bumper, the three-row towing SUV exudes power and fortitude, offering a robust V8 engine and up to 7,000 lbs. of tow muscle. 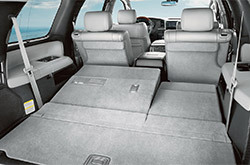 However, it's also highly refined, making it cozy, quiet and oh-so comfortable even when all eight seats are occupied. To learn more about the 2018 Toyota Sequoia for sale in Evansville, continue reading our review below. Afterwards, be sure to check out our photos and use our third-party comparison tool to see how the full-size Toyota SUV compares to the competition. What Trims Are Available for the 2018 Sequoia? If you're looking for a full-size SUV with seating for eight and plenty of cargo space, you can't go wrong with the 2018 Sequoia near me. The Sequoia offers 19 cu.ft. of storage behind the third row, 67 cu.ft. with the third row folded and 120.1 cu-ft with both rows folded. For 2018, the Sequoia is available in a total of four trims, starting with the entry-level SR5. Standard equipment includes new LED headlights, 18-inch wheels, a power rear window, built-in rear sunshades, a sunroof, a rearview camera, Bluetooth connectivity, a 6.1-inch touchscreen and an eight-speaker sound system. For more equipment, 2018 Sequoia reviews suggest opting for the available SR5 Premium package, which adds a power liftgate, leather upholstery, heated front seats, an auto-dimming rearview mirror and integrated navigation. 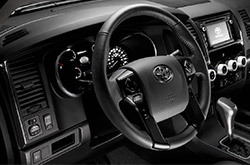 Other trims available on the Sequoia are TRD Sport, Limited and Platinum. New for 2018, TRD Sport adds performance-inspired extras like 20-inch wheels, a sport-tuned suspension and Bilstein shocks. The mid-grade Limited adds the equipment from the SR5 Premium package plus 20-inch wheels and power-folding and auto-dimming exterior mirrors. Sitting at the top of the lineup, the Sequoia Premium offers plenty of bells and whistles, from second-row captain's chairs and ventilated front seats to rear-seat entertainment and a 14-speaker JBL sound system. An electronically modulated air suspension is also standard on this configuration. How Much Horsepower Does the 2018 Sequoia Have? The 2018 Sequoia's 5.7-liter V8 engine and six-speed automatic transmission carry over once more, giving the full-size SUV plenty of stamina for off-roading and trailering. Output is a whopping 381 horsepower and 401 lb-ft of torque, the Sequoia undoubtedly knows how to use it! In fact, it boasts one of the fastest 0-60 mph times in its class at 6.7 seconds. Rear-wheel drive is standard, although 2018 Sequoia reviews recommend embracing the SUV's off-roading prowess and opting for the four-wheel drive. What Safety Features Come on the 2018 Sequoia? New for 2018, the Sequoia comes standard with Toyota Safety Sense. This suite of advanced driver assistance technologies includes adaptive high beams, dynamic cruise control, lane departure alert, and a pre-collision system with automatic emergency braking and pedestrian detection. Other standard safety features on the 2018 Sequoia include trailer sway control, front and rear parking sensors, and blind-spot monitoring with rear cross-traffic alert. The esteemded 2018 Toyota Sequoia should be on your shopping list, especially if you've been looking for the 2018 Infiniti QX80, GMC Yukon, Chevrolet Suburban and the Ford Expedition near Evansville. You may realize that its sleek design and cabin features are just what you in a daily driver. 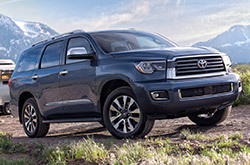 Now that you're almost wrapped up with our 2018 Toyota Sequoia review page, make sure to check out great short-term lease incentives offered at Kenny Kent Toyota! We're a resident Toyota auto retailer where you can find hot manufacturer incentives - not only for the Toyota Sequoia, but also for other new and used cars. 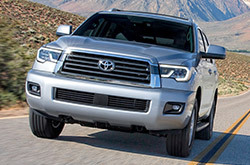 After reading through our 2018 Toyota Sequoia review, note the specs that you found essential; they'll help you make a responsible vehicle purchase that you won't regret. 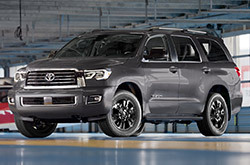 Check out new Toyota Sequoia models at Kenny Kent Toyota - submitting a request for a test drive on our site is a simple process using our online form. Are you hoping to see its interior before visiting? Check out our video to get a glance at its cabin equipment!